Dozens of wise, faithful women. Sixty-five messages of hope and inspiration. 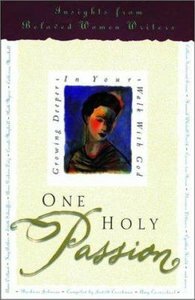 One Holy Passion.For every woman who has longed to sparkand feeda holy passion for the living God, Judith Couchman's thoughtful compilation offers valuable wisdom on how to draw intimately close to Him. Featuring sixty-five writings by some of the most prominent Christian women writers of our time, this stirring gift book illuminates the spiritual issues that women care about most, including loving God, spending time with Him, embracing His forgiveness, and listening for His voice. Some chapters are reflective, others practical. All are inspiring. You, too, can be challenged and encouraged by the collective wisdom of women who have walked with God for many years as you join with your sisters in the pursuit of an enduring, life-changing, and holy passion. - Publisher Unique collection of the warmest and most memorable writings from 100 outstanding Christian women authors: Amy Carmichal, Mother Teresa, Catherine Marshall, Hannah Whitall Smith, Barbara Johnson, Madeleine L'Engle, and many others. Contemporary women readers will find their own passion for God awakened and deepened by these stirring reflections. Unique collection of the warmest and most memorable writings from 100 outstanding Christian women authors: Amy Carmichal, Mother Teresa, Catherine Marshall, Hannah Whitall Smith, Barbara Johnson, Madeleine L'Engle, and many others. Contemporary women readers will find their own passion for God awakened and deepened by these stirring reflections.